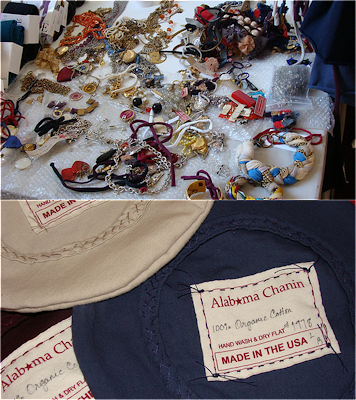 Because I just can’t get enough, I thought I’d share with you the photos from Alabama Chanin’s fashion week show. Opting out of the big tent, big hype atmosphere, AC had the models mingle and chat while being photographed in the newest wares. The detail in this cardigan is so beautiful yet very wearable and the new jewelry collection below has caught my eye for all its interesting detail as well. Eco-chick was lucky enough to attend the show and took these great pics, for more see her post. Oh wow, that's such a fun way to hold a fashion show! Gorgeous photos.